At the 22nd Zeiden neighborhood get-together on June 6th 2015 in Dinkelsbühl marching through the Wunderkreis was one of the highlights. In my first post from June 21st 2015 I wrote extensively about the Wunderkreis itself and the more “technical” aspects (see Related Post below). For those who want to know something more about the historical background, I recommend reading the article by Richard Myers Shelton in Caerdroia 44 or to get informed by the articles mentioned in Related Links. The people of Zeiden themselves have written about their traditions and their customs. In this post, it’s more about the march through the Wunderkreis itself. Set on a beautiful day in a beautiful environment, i.e. in the heart of the well-preserved medieval Dinkelsbühl, this event was one of the highlights at the 22nd Zeiden neighborhood get-together on the old pavement in front of the “Schranne”. The through traffic was blocked off the Weinmarkt this afternoon and so many astonished tourists were marvelling at the white lines on the pavement. A local baker (picture 7) baked about 250 Kipfel specially for this day. The march itself took about 15 minutes. After that the Zeiden brass band offered another open-air concert, where some brave couple even danced. On this day I had the opportunity to meet the current neighbor father Rainer Lehni (pictures 8, 11) and the old neighbor father Udo Buhn (Figure 20), and spoke with the people of Zeiden themselves. Clicking on a picture will open the carousel, clicking × in the top left-hand corner of the carousel, or the “Esc”- key on your keyboard, will close it. Numerous participants walked along the lines of the Wunderkreis to the sound of the traditional Kipfelmarsch, performed by the Zeiden brass band and were each rewarded with a Kipfel (croissant). Probably we will now have to wait some more years until the next march through the Wunderkreis? Although the original Zeiden Wunderkreis still exists in today’s Codlea (now Romania), it would be fine if the Zeiden Transylvanian Saxons could continue their tradition here in their new homeland of Germany with a new permanent Wunderkreis. Note for TLS members: Read the excellent article by Richard Myers Shelton in Caerdroia 44 (April 2015) about the Transylvanian Wunderkreis. Now it is widely completed: The vine labyrinth in the vineyard at the Geisberg of Wiesenbronn. It has more than 50 metres of diameter and is put on from about 1320 vines which are tall, in the meantime, more than 2 metres. The grapes are mature, and you can choose between 10 different types of grapes, mostly seedless. Because one may miss the labyrinth for the vines, a look from the bird’s-eye view is recommended. And this was granted to me the past days (thanks to my son with his aircraft). I would like to share this look with the visitors of this blog. From above one sees the whole labyrinth and can also understand rather good the alignment. 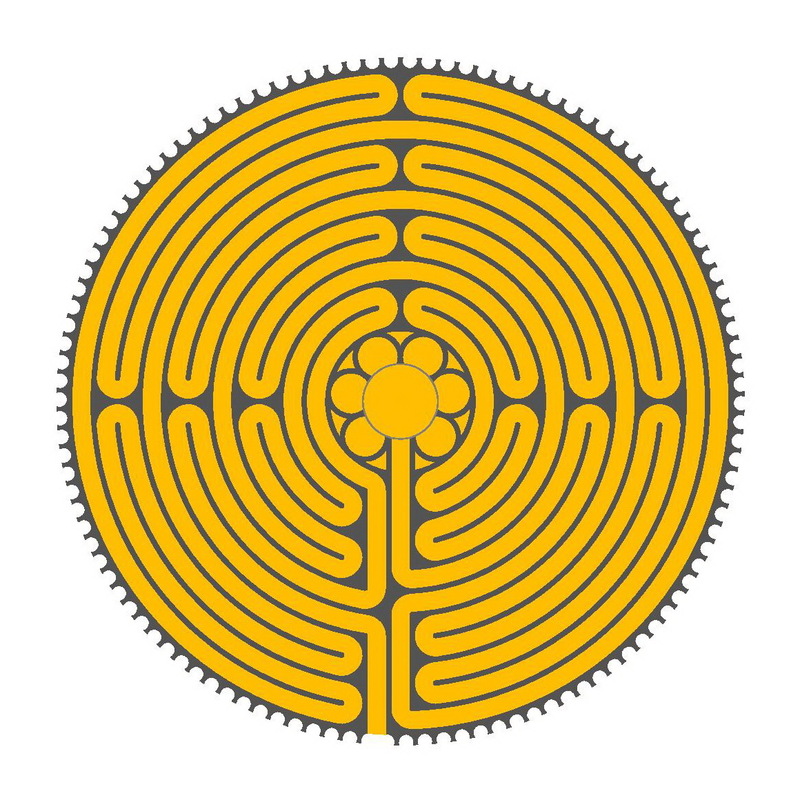 This follows the Chartres labyrinth and has 9 circuits instead of 11 like the original. The first both are left out. But, otherwise, the alignment is identical. With changes, caused through the building construction, like the width or length of the paths, arrangement of the entrances and the configuration of the middle. Thereto the wine growers contrived something special. One reaches the center from two sides, shaped by a sort of room-divider in crooked form. A short hint to a better orientation in the video: In all pictures you may see the middle of the labyrinth. And beside the room-divider stands as a small bush like a “beauty spot”. With that one can align oneself anew. Only from above one recognises best the structure and the beauty of a labyrinth. For birds this is no problem, but still for us. We have this look maybe as a skydiver, paraglider, passenger in a balloon or an airplane? This is why I am glad that I can show now some labyrinths from the bird’s-eye view. I owe this to my son, which is owner of such a new “aircraft” with camera below, and generously has made some overflights. Along the waterfront of the river Main (Mainlände) are still standing the sculptures of this year’s sculptor’s symposium to the subject Panta rhei (everything flows). The contribution of the the kindergarten children Saint Sebastian to this was a first with sawdust scattered Knidos labyrinth on a meadow near the volleyball court, that now is cut. 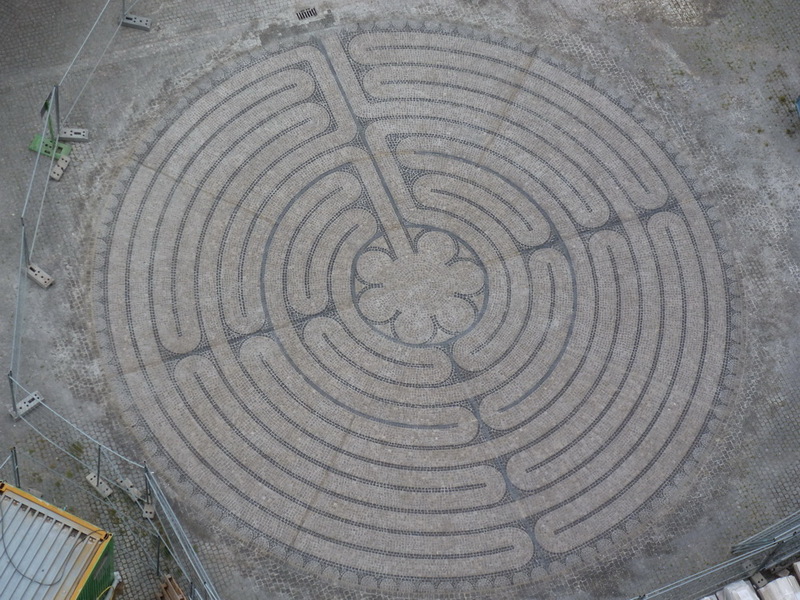 The second labyrinth of the same type is found on a meadow below the pilgrimage church “Maria im Sand”. The entrance is beside the sculpture “Fremder” (stranger), and the labyrinth is aligned to the sculpture “Jakobsstein” (Jakob’s Stone) standing there to represent the end of the Dettelbach sculpture way “Pilgervolk” (pilgrim’s People) from the symposium in 2005. At the beginning of the year we made some overflights from other labyrinths. The videos can be watched on Youtube. Also in Google Earth one can sometimes see labyrinths if the quality of the satellite pictures is good enough. The knowledge of the geographic coordinates of a labyrinth (virtually their house number and address) quite help to the search. 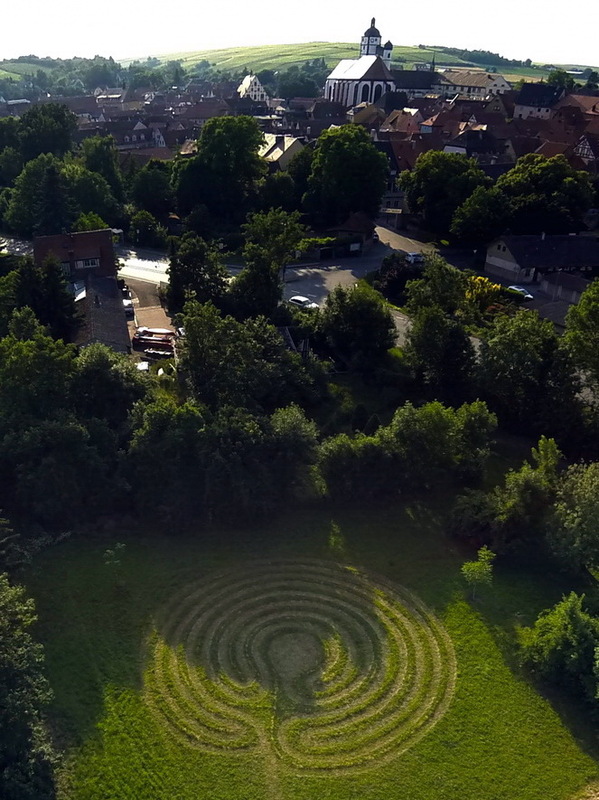 I owe an other nice view from above to my son-in-law who was on the move as passenger in a balloon just over a year ago, and by chance discovered the labyrinth at Eisingen. The photos are to be seen in the post quoted below. 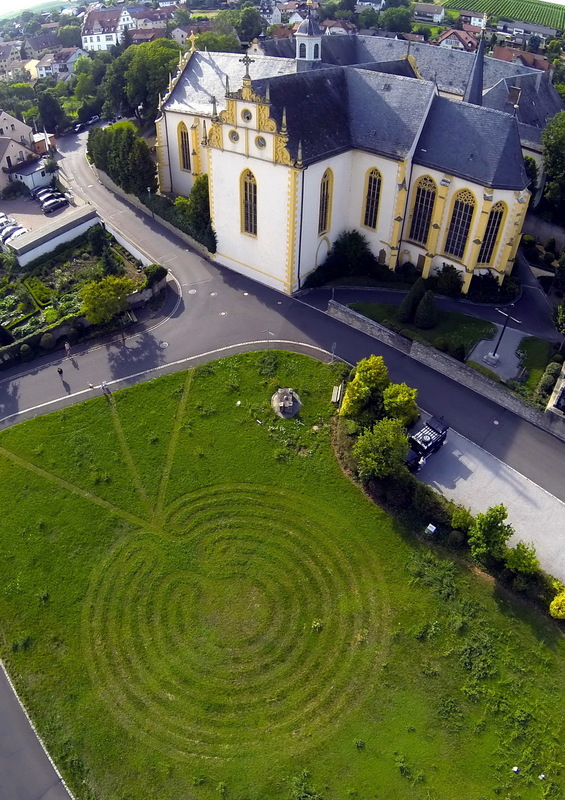 On the 10th of September, 2012 a new labyrinth was inaugurated at the highest point of the municipality of Tittling in Lower Bavaria (Germany), on the Blümersberg. 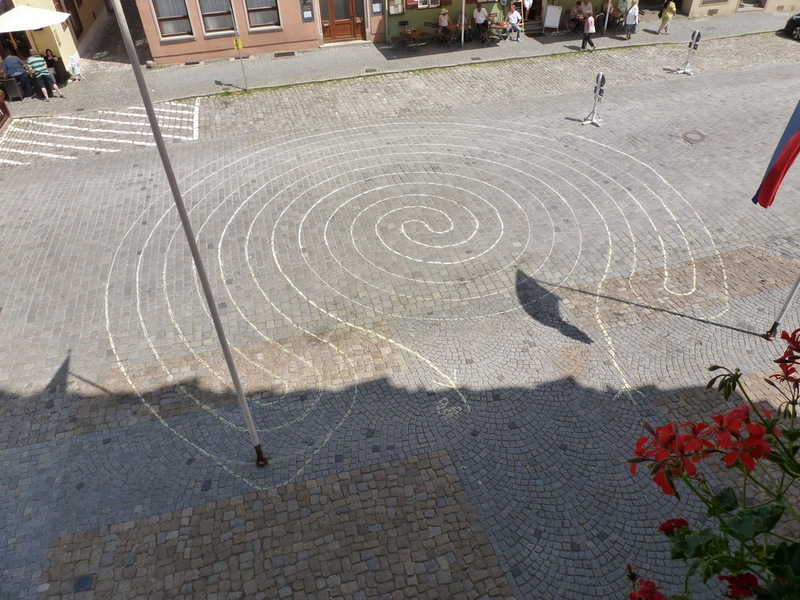 The pilgrims’ path attendants Renate Simmet-Burghart and Eva Reif had the idea to offer a labyrinth as a spiritual tool. Tittling is a station of the European Via Nova pilgrims’ path who runs between Austria, Bavaria and Czechia. The labyrinth of granite stones was built with the vigorous support of the municipal builder’s yard. From the Blümersberg one has a nice panorama in all four directions, to the hills of the Bavarian Forest in the north, and to the Austrian mountains in the south. A cross, surrounded by lime-trees and benches, is situated beside the reservoir of the water supply. From here steps lead to the meadow with the labyrinth on the cover of the reservoir. There is a small footpath, passing a memorial stone for Tittlings freemen, to a little view hill at 575-m height. A total of 7 boards with short statements to the labyrinth surround the whole. 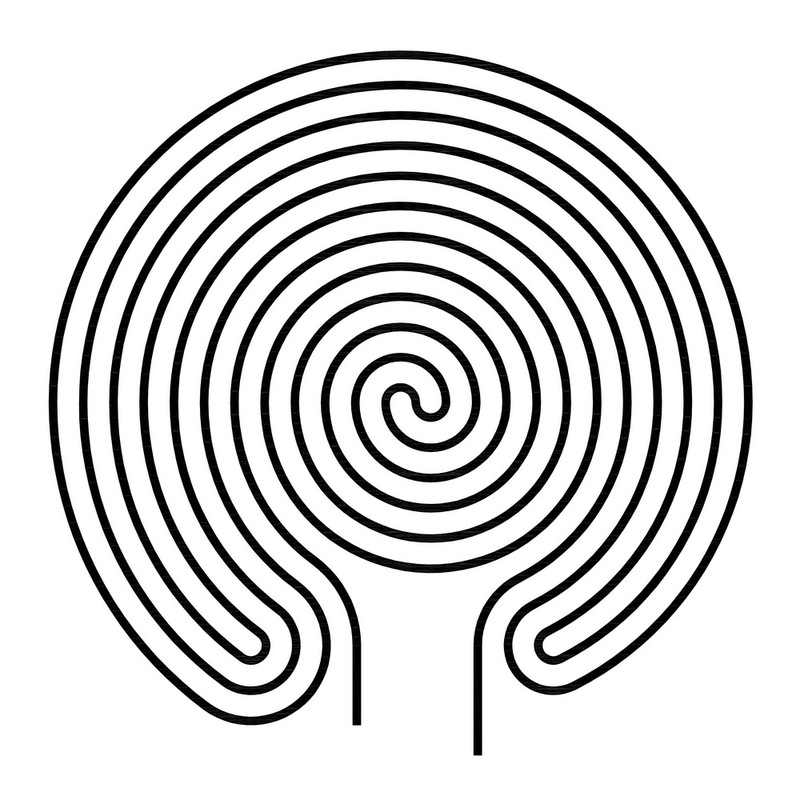 The classical labyrinth has 7 circuits and a bigger middle (Knidos labyrinth). The diameter amounts to 17 metres, the center with three differently high granite stones has 3 metres. The paved paths are 40 cm wide and run between 60 cm wide grass stripes. The distance from the entrance to the center is about 224 metres. 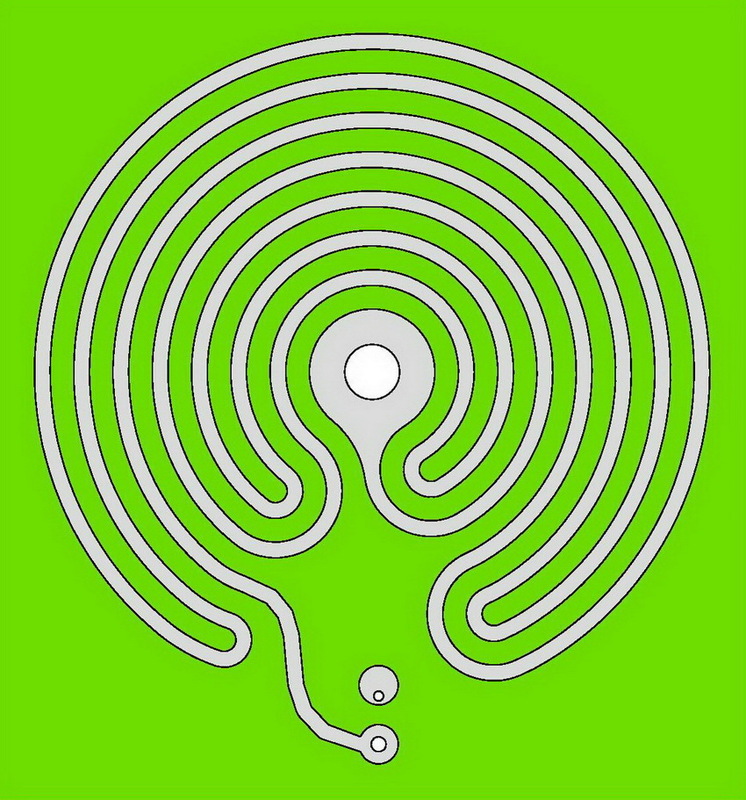 The exact location of the labyrinth is: N 48 ° 43′ 50.5″, E 13 ° 22′ 58.0″. 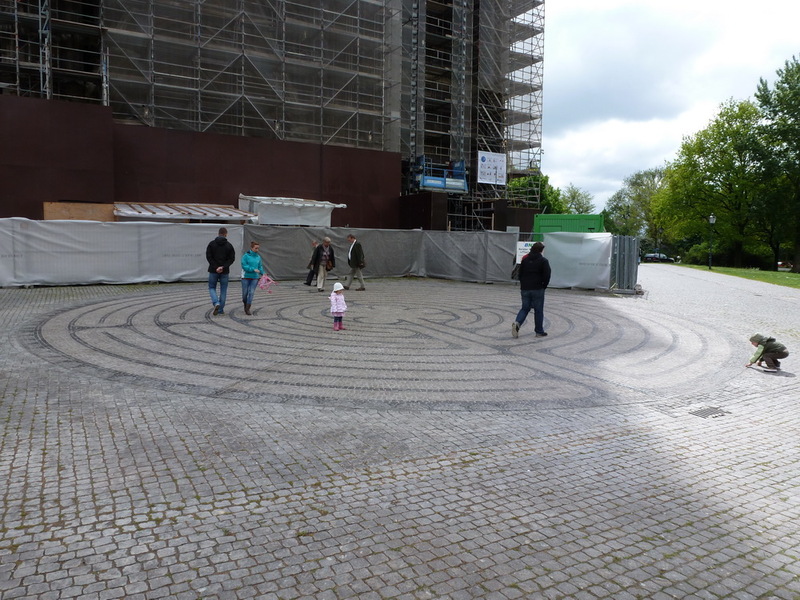 On World Labyrinth Day 2012, a new labyrinth was inaugurated in front of the west portal of the Dom (Cathedral) of Magdeburg. The Magdeburg Cathedral is as old as the Cathedral of Notre Dame de Chartres. 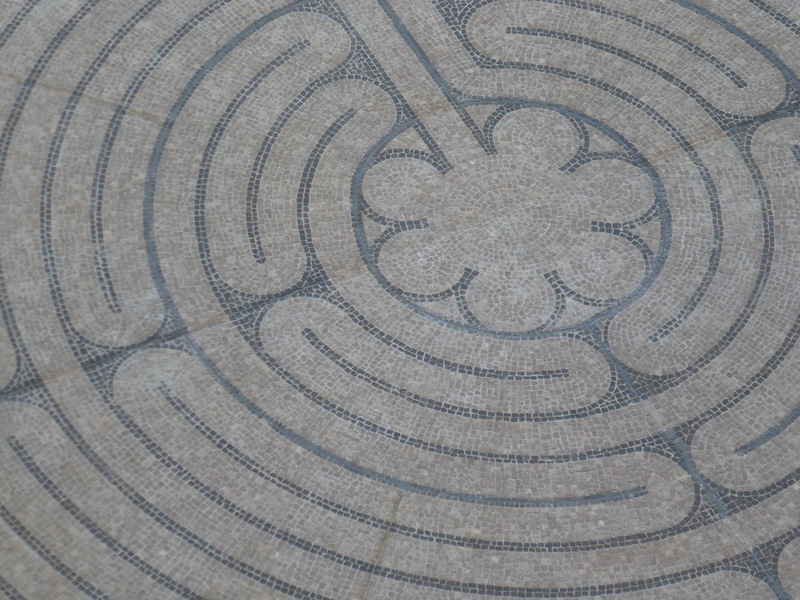 So it was natural to focus on the famous Chartres labyrinth. Thus it happened that 800 years after its construction from around 1200 a pavement labyrinth modeled on the original was created on this place. 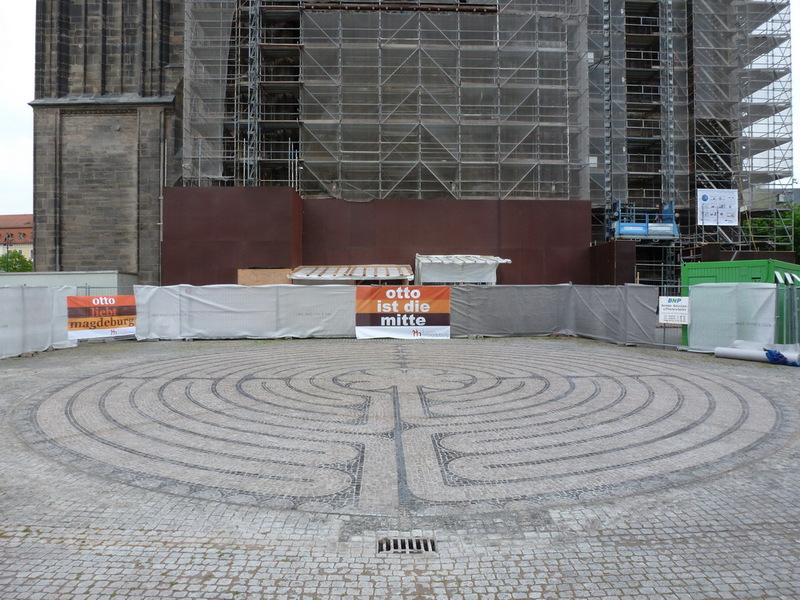 During the process of reconfigurating the complete Domplatz (cathedral place) by the city of Magdeburg, the first building project was the construction of the labyrinth. The Magdeburg Lord Mayor Dr. Lutz Trümper handed it over on 5th May, 2012. Cathedral preacher Giselher Quast blessed the labyrinth. Gundula Thormaehlen (co-founder of the TLS) called over the heavenly forces from four directions with her mussel horn. The Martin Rühmann band contributed musically to the celebration. The banners pointed to the Kaiser-Otto-Year exclaimed for 2012 in Magdeburg. The concept and the implementing of the labyrinth rested in the hands of the landscape architect Daniela Süssmann from Magdeburg with her committed employees. For many years she had had the idea for building a labyrinth on the Domplatz. Now, finally, it came into being after many preliminary talks with the municipal authorities, the monument preservation, and the cathedral parish. Special recognition is due to the company Barleber Naturstein Bau- und Pflasterarbeiten whose site engineers, foremen, and paviours moved a total of 47000 tessellated paving stones carefully and exactly. In the middle of the labyrinth a big amethyst, to which curative forces are attributed, was incorporated under the paved surface. Everybody involved in the construction has achieved a masterful work. Never before a labyrinth type Chartres has been put into practice so perfectly as a pavement labyrinth. The width of the walkable paths amounts to an average of 40 cm and is built of Bernburg shellbearing limestones, limited by a 10-cm-wide line of dark basalt stones. The way from the entrance into the center measures about 287 m. The middle has a diameter of 3 m, thus, including the 113 lunations, a whole diameter of 14.45 m arises. The paving stones and the mortar between them are moved on a foundation of concrete and are integrated into the available, unbound granite pavement surface. Hence, it shows some expansion joints which will still fade, however. The whole surface in front of the west towers which are being restored at the moment shows an inclination leading away from the cathedral, so that the labyrinth is well recognizable. Unfortunately, it was raining at the time of the inauguration at 1 pm, which, however, didn´t cast a cloud over the happy atmosphere of departure. 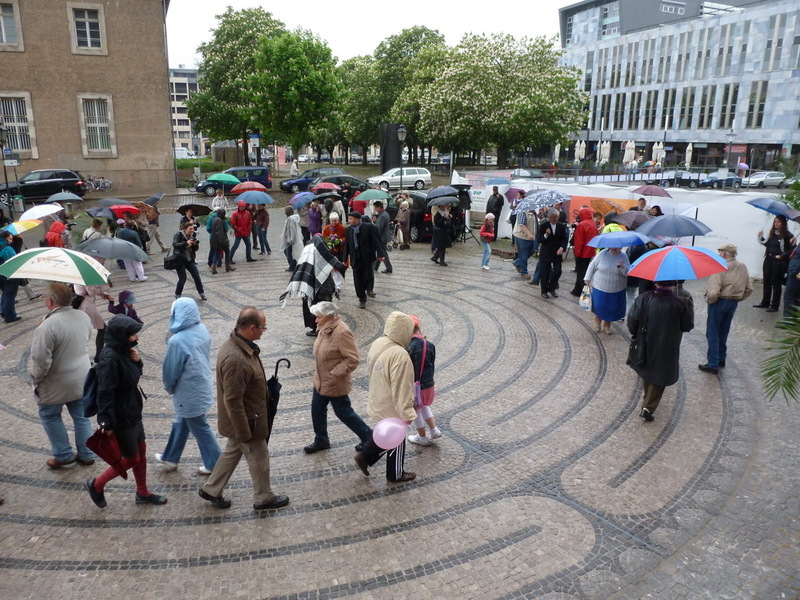 Thus Magdeburg has joined solemnly on the worldwide labyrinth movement all around the globe, under the terms of the World Labyrinth Day: Walk as One at one. Likewise the citizens have done three years ago on the 1st World Labyrinth Day in 2009. After the end of the renovation works (probably in the end of 2012) on the west towers the west portal of the Dom will be visible again and the labyrinth can unfold his full effect as inviting symbol. However, by now it is a sign for a new beginning, for return and coming home, which invites all people to walk it. Magdeburg is worth a journey. to be on our path.